ASUR: Airborne SUbmillimeter Radiometer, capable of measuring vertical profiles of the SCIAMACHY data products ozone, N2O, H2O, BrO, and NO. Further ASUR measures ClO which is useful for intercomparison with SCIAMACHY's OClO data product. AMAXDOAS: Aircraft Multi-AXis Differential Optical Absorption Spectrometer, capable of measuring stratospheric and tropospheric columns of the SCIAMACHY data products ozone, NO2, H2CO, BrO, and OClO. AMAXDOAS is operated by a collaboration of the Universities of Bremen and Heidelberg. OLEX: Ozone Lidar EXperiment, capable of measuring highly resolved profiles of ozone and aerosols. OLEX is operated by DLR. Using the new high-resolving chirp-transform spectrometer together with the ASUR instrument, the profile information provided by ASUR is extended into the mesosphere (about 65-70 km). 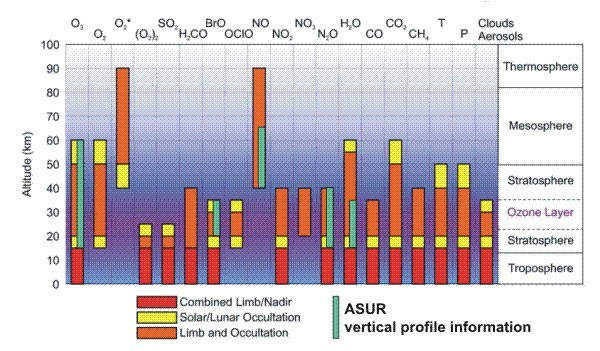 Providing profiles in such a large altitude range makes ASUR unique for the validation of vertical profiles derived from the SCIAMACHY measurements in limb and occultation modes. In addition ASUR can provide vertical profiles of HNO3 for the validation of MIPAS measurements. Measurement capabilities of the SCIAMACHY instrument and targeted data products and altitudes for intercomparison and validation by ASUR. Bovensmann, H., et al., SCIAMACHY - Mission objectives and measurement modes, J. Atmos. Sci., 56, 127-150, 1999. The validation campaign consists of two parts, each part having about 50 flight hours and consisting of a northern and a southern flight leg. The two flight legs allow to fly latitudinal cross sections that cover all latitudes from the Arctic to the Equator. 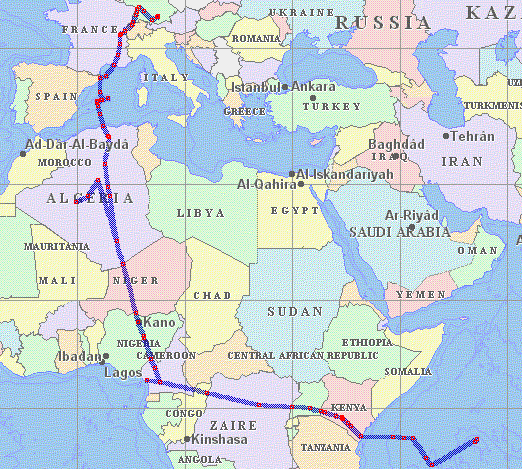 The first part of the campaign will be flown in September 2002 such that measurements in northern hemisperic late-summer conditions are obtained. 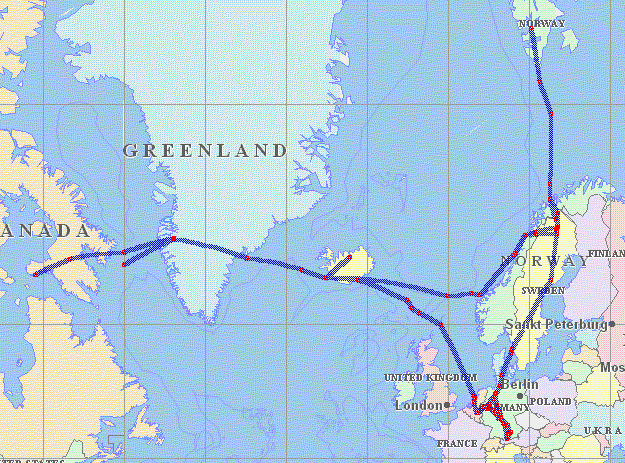 The second part will take place in February/March 2003 to validate in late-winter conditions. Campaign basis will be Oberpfaffenhofen, Germany. Two small test campaigns were performed already in May 2001 and January 2002, respectivly, leading from Oberpfaffenhofen to eastern and southern Europe. The simultaneous operation of all instruments was demostrated successfully. Besides its operational data products, ASUR demonstrated its capability to measure HCN and NO in the upper atmosphere for the first time. The Sciamachy validation campaign is carried out in close cooperation with lidar group and the flight department of the German aerospace center (DLR) as well as with the Institute of Environmental Physics of the University of Heidelberg. The campaign activities are funded by the Federal ministry for education and research (BMBF) and DLR. 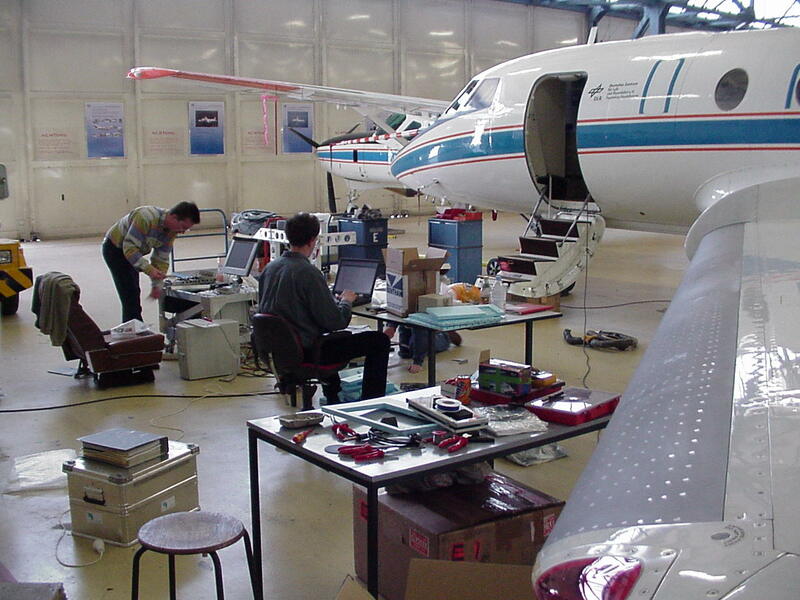 The SCIAMACHY validation payload being integrated into the Falcon research aircraft. 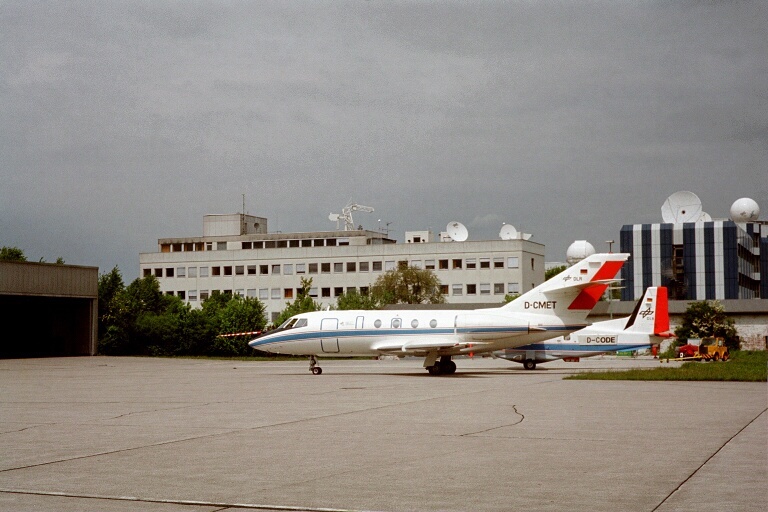 The Falcon aircraft preparing for take-off on the airfield in Oberpfaffenhofen.